"We just took delivery of our third and fourth Billy Goat aerators, and are looking forward to another highly productive and profitable aerating season. We just took delivery of our third and fourth Billy Goat aerators, and are looking forward to another highly productive and profitable aerating season. After having used Ryans and Bluebirds in the past, we bought our first Goat in the spring of 2002, and it’s still running strong after hundreds of jobs each year. Although it is bigger and heavier than the aerators we used to use, it is faster, easier to use, and it does a much better job. 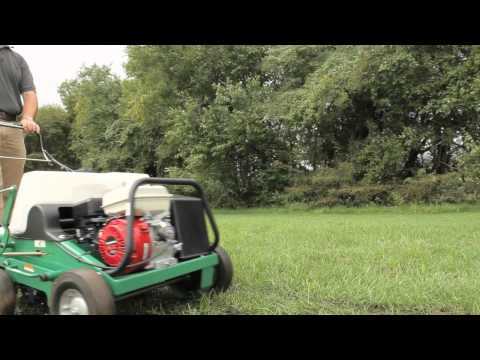 Some of our customers even notice the difference, and want to make sure we’re still using “those low, four-wheeled” aerators when they call to set an appointment. Thanks for the truly revolutionary design." "The machine is way easy to operate and runs quite well. It pulls plugs with ease. The machine is very quiet and does good on gas consumption. Overall, the machine is awesome! You have a great product! The machine is way easy to operate and runs quite well. It pulls plugs with ease. The machine is very quiet and does good on gas consumption. Overall, the machine is awesome! You have a great product!"